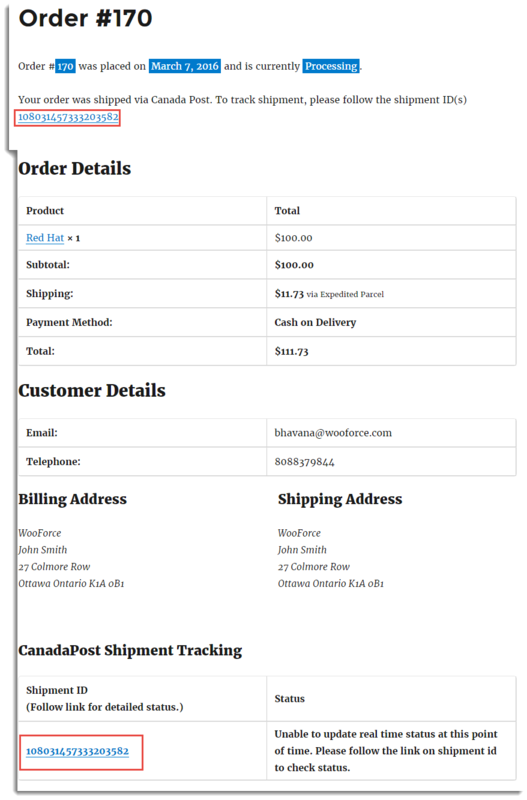 In this tutorial, we will show you how easily you can set up WooCommerce Canada Post Shipping Plugin with Print Label to get real-time Canada Post Shipping Rates, print shipping labels and to track your orders from your WooCommerce store. It is a detailed guide to integrating Canada Post services to your WooCoomerce store. Canada Post Corporation, known more simply as Canada Post which functions as the country’s primary postal operator. 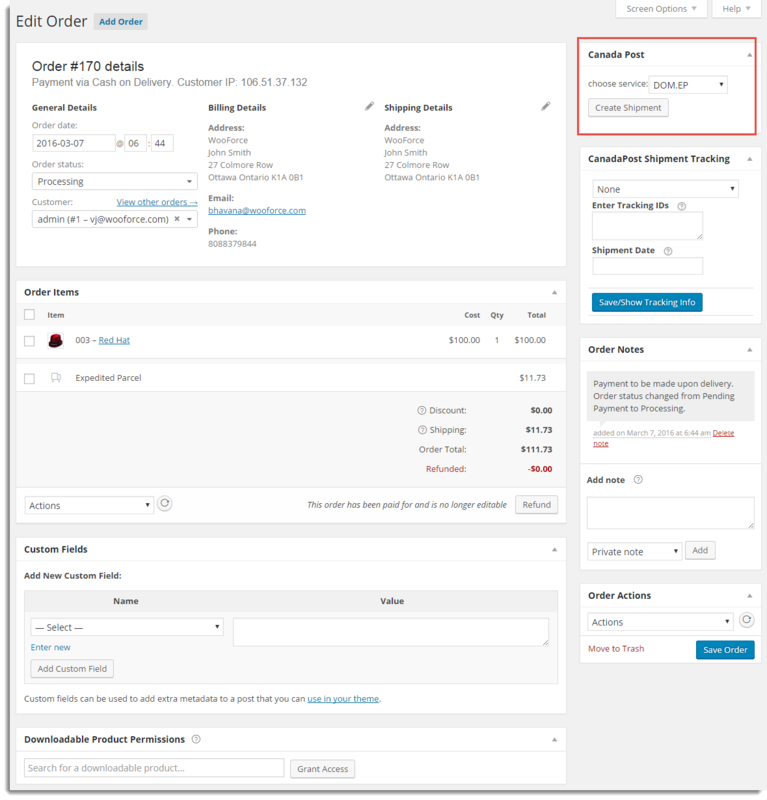 With the help of WooCommerce Canda Post shipping plugin, you can get the real-time rate for the contract as well as non-contract Canda Post Customers. Rate depends on box dimension, weight, and address of sender and receiver. You can print the labels with shipment tracking information for sender and receiver. WooForce plugin allows you to pack items either individually, based on weight, or using built-in box packer. 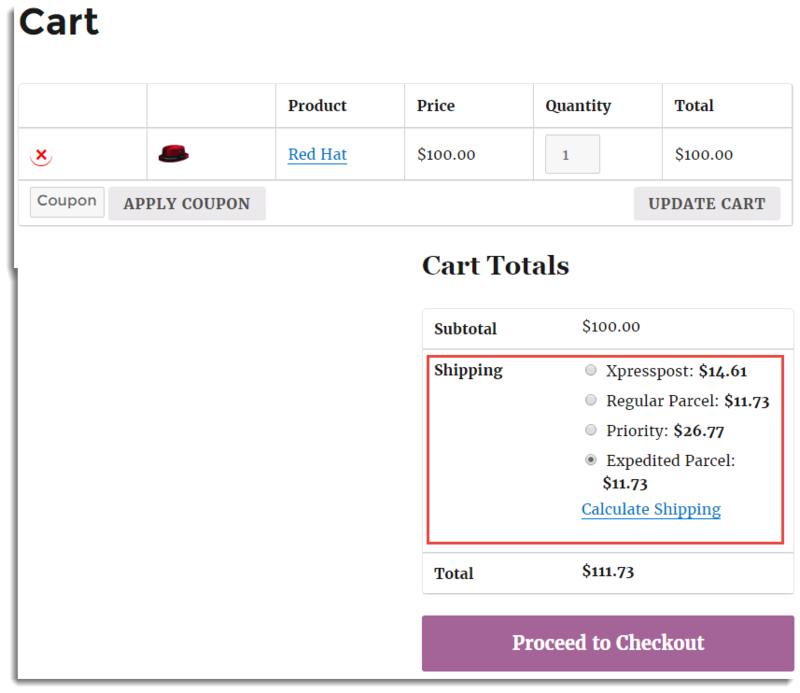 This tutorial will give you an excellent launch pad to kick-start the Usage of WooCommerce Canada Post shipping plugin. It will give you all the essential knowledge and step-by-step instructions. After purchasing the WooCommerce Canada Post shipping plugin, the plugin Zip file is available in MY ACCOUNT. Navigate to Plugins > Add New to upload the downloaded WooCommerce Canada Post plugin. Activate the WooCommerce Canada Post plugin. *Note: You can skip entering the API License Keys while testing the plugin in the Test Mode. However, API License keys are required while using the plugin in the Live Mode. Real-time Rates: Enable this option to get the real-time shipping rates from Canada Post. Note: Disabling Canada Post Shipping method only disables rates in cart/checkout page. Print Label and Shipment Tracking functionality are still available to you. Debug Mode: If you are not getting proper rates( lesser or higher than expected), not getting all the available shipping options, or not getting rates at all, then you enable Debug option to find the error(s). You can also see the warning(s) by WooCommerce plugin. By enabling debug mode, you can trace issue using log. You can see information about debugging at the top of the Cart and Checkout page. After enabling debug mode, add a product to cart. 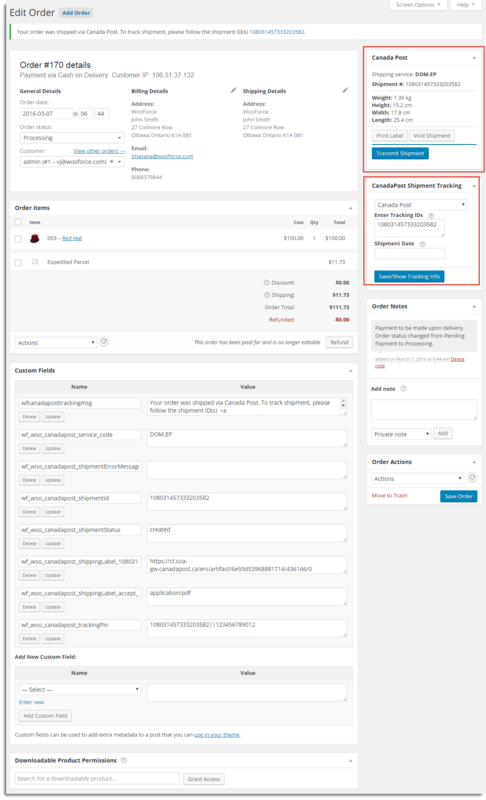 Go to cart or checkout page to see the debugging information. Method Availability: This option allows you to choose whether you want the Canada Post shipping method enabled globally or for some specific countries. All Countries: Enables Canada Post Shipping Method for all countries. Specific Countries: Enable Canada Post Shipping Method for specific countries. Registration: This option allows you to create a Canada Post Account (if you have not already registered), and this also fetches the Canada Post Credentials like the Merchant UserName, Merchant Password, Contract Number, etc. if you have already registered to the Canada Post. API Mode: This allows you to choose between the Test and Live modes. Select the option based on your credentials. Contract Number: It is the policy of Canada Post Corporation to contract for services with the objective of attaining the best overall value. Canada Post contracts with those who satisfy the Corporation’s objectives of obtaining services in a timely manner. Enter Contract Shipping Number if you are a Canada Post commercial customer with a parcel agreement. For more information, See Contract Shipping. Non-Contract Shipping: For Solutions for Small Business customers, the Contract Number is not required. For more information, See Non-Contract Shipping. Payment Method: The plugin allows you to choose between the payment options for shipping labels. You can pay via your Canada Post Account or Credit Card. Origin Postcode: It is the postcode of the place, from where you are shipping items. How to register Canada Post Account from the WooCommerce Canada Post Shipping plugin? In the plugin settings, click on Canada Post Account. This will allow you to log into or sign up for Canada Post. After successful login/sign-up, select a payment method, as shown in the image below, and click on Continue. After this, you will be redirected to the Terms and Conditions page where you can take a look at the terms and conditions of the Canada Post. After reading the terms and conditions, click on Submit. Now you will be redirected back to the WooCommerce Canada Post plugin settings with the following message displayed on your screen. Just wait for some time and the following message will be displayed on the screen. This means, your Canada Post Account details are successfully integrated with your store. This way your Canada Post Registration/Integration will be complete to your WooCommerce store. Commercial: These are the rates provided to Canada Post Customer who ships frequently and in large scale. Counter: These are the rates provided to Canada Post Customer who does not ship frequently. Due: It shows the final rates which include base shipping cost and other charges like taxes, surcharges, discounts, etc. Base: It shows only base shipping rates and does not include any other charges. Lettermail Rates: Letters are items such as envelopes, greeting cards, postcards, bills, specialty stationery, legal documents, magazines and brochures that fall within certain size and weight requirements. Enter the amount according to letter size. Note: Lettermail rates must be defined in the plugin settings since it is not the part of the Canada Post API. You can not Print Label and Invoice for Lettermail. Coverage: It shows the final rates which include coverage against loss or damage. The availability and the limits of liability coverage depend on the service selected, country of destination, and the nature of the items being shipped. Signature: Requesting a signature on delivery is ideal when you require proof that your mail item has been delivered. A signature image is captured and can be viewed online by entering the item’s tracking number. Age proof required 18 (or) 19: If the receiver appears to be less than 25 years of age, a photo identification proving age will be requested and the signature and name of the signatory will be recorded. The item will only be handed over to a person with an acceptable identification (ID) proving the required age (18 or 19) selected by the customer as part of the Age proof required the option. Do not safe-drop: This option changes the delivery process only for items that are usually delivered to the door. A delivery attempt will be made at the door and, if no one is available to receive the item, the item will not be dropped. The addressee will be able to pick up the item from the designated post office. Delivery Time: Enable this option to show an approximate time to deliver the shipment. Delivery Delay: It adds the entered value to actual delivery time and accordingly it shows delivery Time. Note: This field is applied only when you select Delivery Time check box in step 5. Pack Items Individually: In this option, each item in the cart is packed separately. Total Shipping cost calculated by adding the shipping cost for each item. 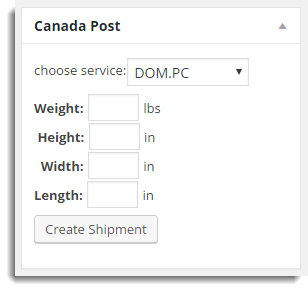 The weight of All Items: In this option, the weight of all the cart item is summed up and passed to Canada Post API to get rates. Pack into boxes with weight and dimensions: If packing items individually do not suit your business, then you can define required box sizes under Box Dimensions section. All the cart items are packed into custom boxes defined in Box Dimensions settings. The best fit box is auto chosen from the defined boxes. This is the recommended option. You can read through Configure box dimensions to understand more in detail. Box Dimensions: These box dimension settings are applicable only when Pack into boxes with weight and dimension is selected. Here, you can define the outer and inner dimensions of boxes. Outer dimensions are the dimensions of the package. Inner dimensions are the dimensions of the product. For heavy packing box, enter the weight of the box so that it gets added in product weight to calculate the shipping rates. You can select the checkbox under Letter if you want to mail the letter. According to the requirement, you can add or remove the box dimensions. -If there is a product X in the cart, then Small Pack Box gets selected for packing. -If there are two product X in the cart, then Medium Box gets selected for packing. -If there are four product X in the cart, then Large Box gets selected for packing. Likewise, you need to define inner and outer sizes for each logical box according to the packing style being followed for different products in different quantity. Offer the Customer all returned rate: This option shows quotes for all the available the services which are returned by USPS and also selected by you in step 2. Offer the Customer the cheapest rate only: This option shows the only service with the cheapest quote from the available services. Services: In the above figure all the services are displayed. You can select the required services. Non-selected services are not shown to the customer even if they are available services from Canada Post. Please go to Canada Post Services for detailed information on each service. You can adjust the shipping price by adding/subtracting the required amount to/from actual shipping cost. You can mention the amount in % and $ for each service. 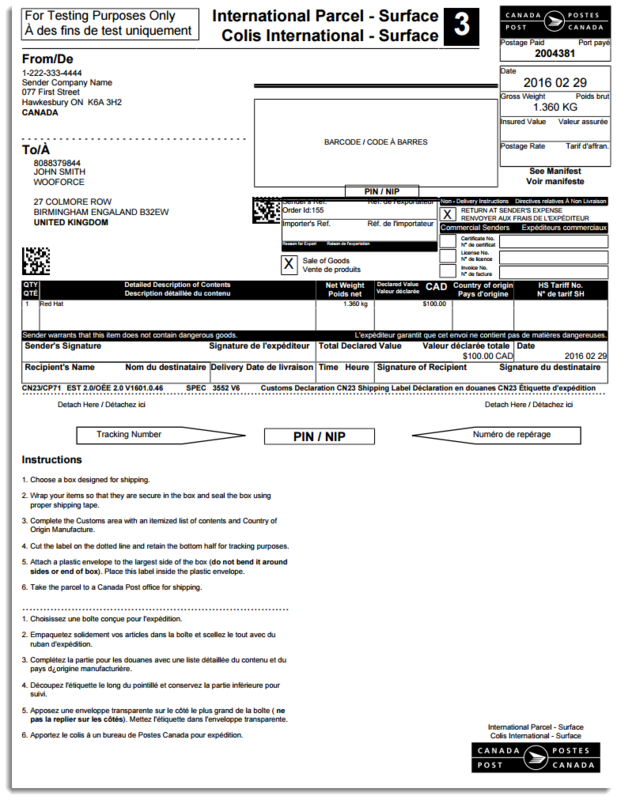 For example: Consider, Shipping Cost of First-Class Mail returned by Canada Post is $5. Total Cost Displayed for FIRST_OVERNIGHT – $10 (5+5). Total Cost Displayed for First-Class Mail is $5.5 (The 10% of 5 is added to 5 to get the actual shipping cost). Total Cost Displayed for FIRST_OVERNIGHT – $10.5 (The 10% of 5 is added to 5 + 5 to get the actual). Default shipping Canada: Enter the required shipping method for Canada. This service is used to generate label when users have selected free shipping. Default shipping USA: Enter the required shipping method for the USA. This service is used to generate label when users have selected free shipping. Default shipping International: Enter the required shipping method for International customers. This service is used to generate label when users have selected free shipping. 8.5X11: This option generates labels in PDF format with a size of 8.5 x 11 inches. 4X6: This option generates labels in PDF format with a size of 4 x 6 inches which is ideal for a thermal printer. Label printing measurement manually: Select the checkbox to enter dimensions( Height, width, and length ) and weight manually. 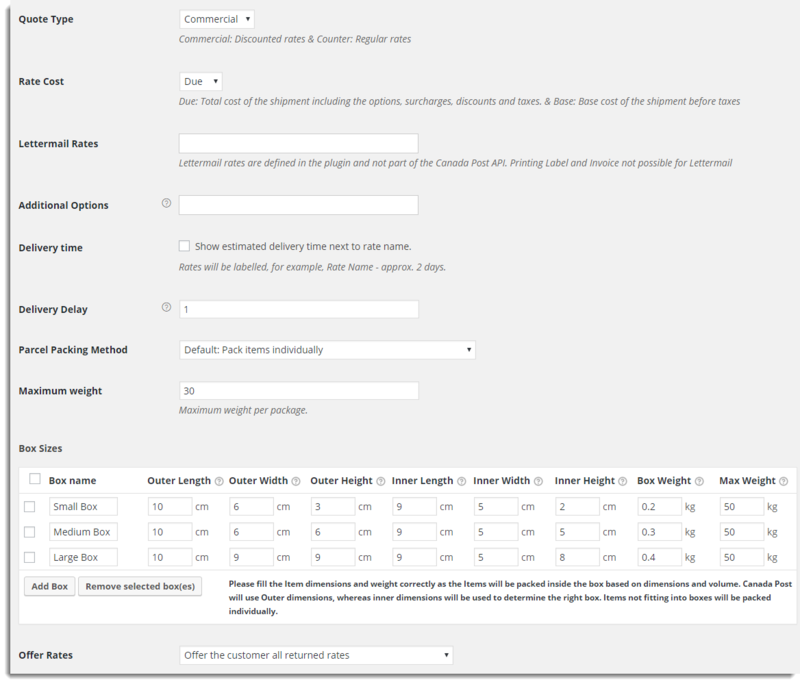 If you do not select the checkbox (default option), then plugin captures weight and dimensions for each of the order items automatically. Note: You must set dimensions and weight for each of your products if you use the default option. Sender Company Name: Enter name of WooCommerce shop. Sender Contact Phone: Enter the phone number of the sender. Sender Address Line1: Enter the first line of Address. Sender City: Enter the city of the sender. Sender State: Enter the State of the sender as a shortcode of the particular state. Pickup: Enable this option if you want your package to be picked up by Canada Post from the location specified by you in the Sender Address Line1 field. Pickup Point Id: As an alternate option, you can deposit your package at a post office or any Canada Post facility. For this, you need a ‘pickup point Id’ that specifies the deposit location. This is a four-character alphanumeric value. This Id enables you to get shipping rates based on your deposit location and the type of mailing you select. To check available mailing services and Ids, read our article on how to find pick up point id for your deposit location. Note: You need to specify the pickup point id only if the pickup field is not selected. Enter the conversion amount if you have a different currency than origin location. This amount gets multiplied with the shipping rates. Note: Leave it empty if the conversion is not required. 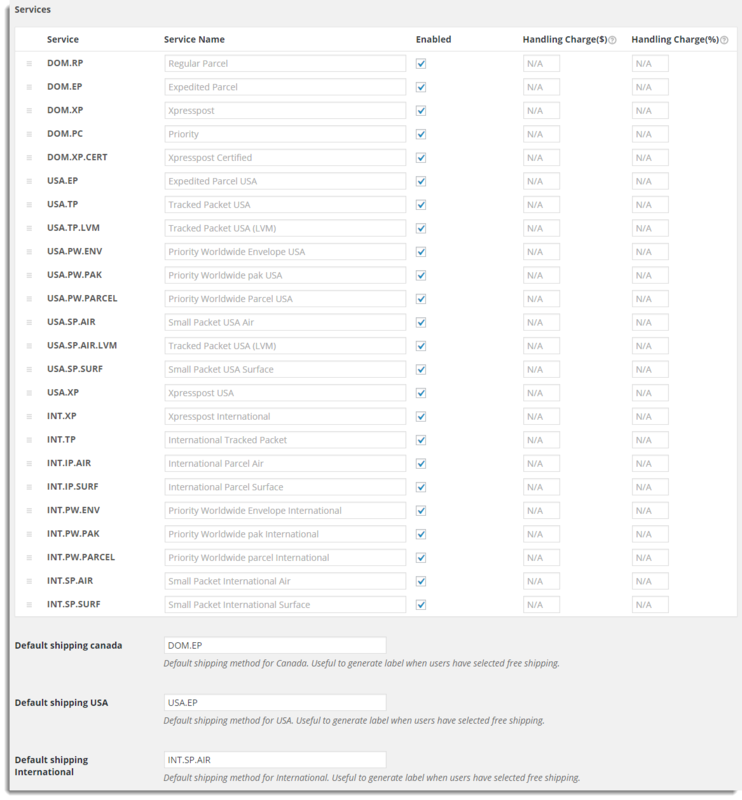 After setting up Canada Post Configuration Settings, your customers can see all available services list on the Cart page which is shown in the below screenshot. The customer can select the required option and proceed with checkout. You can print the label in PDF format based on the Configuration settings. By default, preferred Canada Post Service for the print label is set to the service that customer selects during checkout. You( as admin) can change the service according to your requirement. For more information about services, you can contact Canada Post customer care. Enter Weight, Height, Width, and Length for the required product. 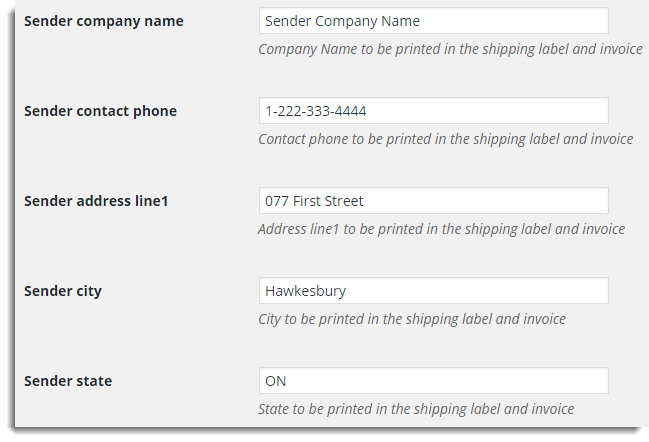 After clicking Create Shipment, Shipment tracking ID automatically gets generated in the tracking box and Print Label button becomes available for printing label. Print Labels: Click Print Label to print the label for the order. You can click Void Shipment to clean up Order labels. 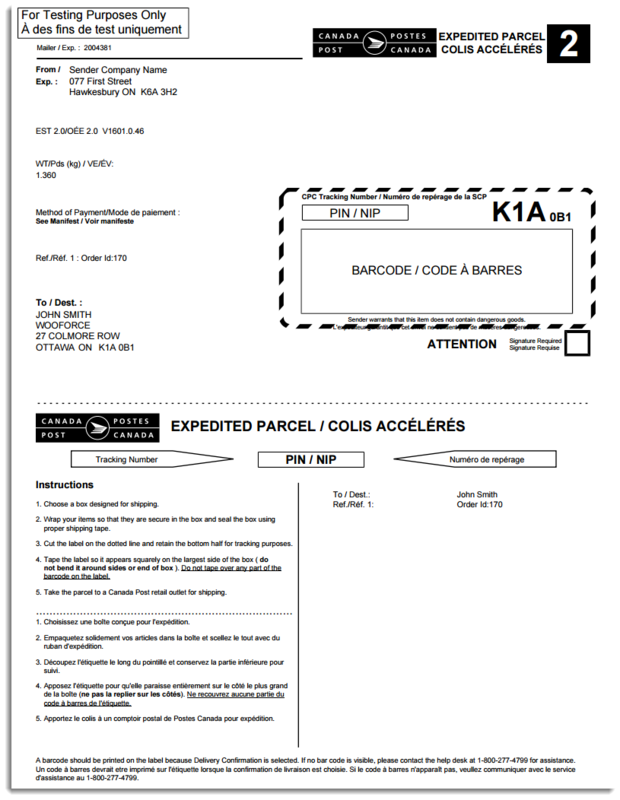 For detailed information see Canada Post Shipment Labels. Click the ID to see the status of the shipment. For detailed information, see Canada Post Shipment Tracking. Manifest is a document detailing shipment contents. You must print the manifest to get the commercial rates and handover this manifest at the time of pick up. It gets printed for all the orders, till the order from which you print the Manifest. For Example, You have got the orders – from #160 to #170. If you print the manifest from Admin order page of #170, then the Manifest gets generated for order #160 to #170. Note: Customer even gets the shipment tracking information through order completion email. 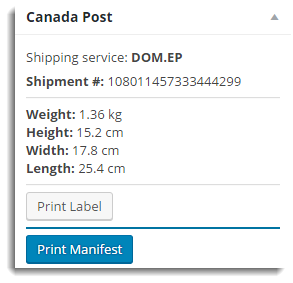 Check out WooCommerce Canada Post Shipping Plugin with Print Label.